The value of a low-fat, purely plant-based diet for reversing type 2 and managing type 1 diabetes has been obvious for more than 75 years. Yet doctors are not learning this information in medical school. The solution to that problem is simple. Healthcare reform activists must demand change from the Liaison Committee on Medical Education and from state legislatures. The LCME can take away the accreditation from any U.S. medical school that fails to provide proper training in nutrition. LAURIE ENDICOTT THOMAS is the author of Thin Diabetes, Fat Diabetes. This article was reprinted on UPC's website with her permission from the online publication OpEdNews, Nov. 8, 2015. Diabetes is currently the seventh leading cause of death in the United States. It is the main reason why adults go blind. It is the main medical reason for people to lose their feet. It is a major cause of kidney failure. Fortunately, the most common form of diabetes can be easily cured and the most serious form can be easily prevented by eating a low-fat, purely plant-based diet. Unfortunately, doctors have been learning practically nothing about nutrition in U.S. medical schools. As a result, doctors often give their diabetic patients bad nutritional advice, which can actually make the diabetes worse. Back in 2012, Dr. George Lundberg, former editor-in-chief of the Journal of the American Medical Association, asked me to coauthor an editorial about this problem for MedPageToday. My book Thin Diabetes, Fat Diabetes (www.thindiabetes.com) explains the problem in greater detail. Most Americans know that there are two main types of diabetes mellitus, but they have trouble remembering which type is which. French-speaking people have no such trouble. They use the term thin diabetes (diabète maigre) to refer to type 1 diabetes mellitus: the severe, incurable disease that results from the loss of the insulin-producing cells of the pancreas. This problem can result from surgical removal of the pancreas. However, it is usually the result of an autoimmune disorder that can be triggered by a protein in cow’s milk. French-speaking people use the term fat diabetes (diabète gras) to refer to the relatively mild, reversible problem that results from gaining too much weight on a fatty diet. Fat diabetes (type 2 diabetes) accounts for nearly 90% of the diabetes cases in the United States. Thin diabetes (type 1 diabetes) accounts for less than 10% of cases. Only about 2% of diabetes cases in the United States are due to a truly genetic problem. The severe forms of genetic diabetes are called infantile diabetes because they are diagnosed in newborns. The milder forms are called maturity-onset diabetes of the young (MODY) because they look like type 2 diabetes but are often diagnosed in young, thin people. Nearly everything that we have been told about diabetes is false. We have been told that diabetes results from eating too much carbohydrate (starches and sugars). We have been told that starch turns to sugar, which turns to fat and makes you fat. We have been told that low-carb diets are good and are particularly good for diabetics. Although it’s true that starches are broken down into a sugar called glucose during digestion, the human body resists converting glucose to fat because about 30% of the calories are lost in the conversion process. That’s why it is so hard to fatten on starches! In reality, a low-fat (~10% of calories), high-carbohydrate diet is the key to reversing type 2 diabetes and maintaining the health of people with type 1 diabetes. Type 2 diabetes is not really a disease. It is a defense mechanism. 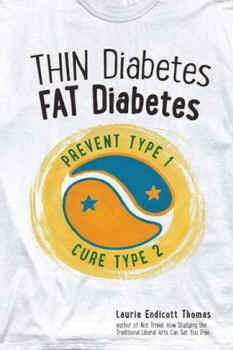 If you have type 2 diabetes, it means that you are a naturally thin person but are eating an unnaturally fattening diet. You have gained too much weight because the fatty foods you are eating are unsatisfying. As a result, you have eaten more calories than you burn up. To resist gaining more weight, your body has started to resist the effects of insulin. Its goal is to burn more fat and less sugar. But as a result, you could end up with too much sugar in your blood. The solution to this problem is to eat the kind of diet that is appropriate for a human being: a diet based on low-fat starches and vegetables. Type 2 diabetes is extremely rare in populations that eat a low-fat diet based heavily on some starchy staple, such as rice, corn, potatoes, cassava, or wheat. Americans can cure their type 2 diabetes by adopting a low-fat, purely plant-based diet. Type 1 diabetes is a more serious problem. It results from the loss of the insulin-producing cells in the pancreas. If you have no insulin in your blood, your liver will have no way of knowing when you already have enough sugar in your blood. As a result, your liver will think that you are about to die of low blood sugar, even if your blood sugar level is actually high. Thus, your liver will keep making sugar out of protein until your blood sugar level goes sky-high. To stay alive, people with type 1 diabetes need to get injections of insulin. A low-fat, high-carbohydrate diet is good for people on insulin. It improves their sensitivity to insulin, and it helps to protect them from heart attacks and other consequences of a high-fat diet. A low-fat, plant-based diet is powerful medicine. If you have any health problems or are taking any prescription medications, talk to your healthcare professional before you make any major change in diet. A sudden change to a healthy diet can lead to serious problems with low blood sugar in people who are taking medication for diabetes. As I explain in Thin Diabetes, Fat Diabetes, the value of a low-fat, purely plant-based diet for reversing type 2 and managing type 1 diabetes has been obvious for more than 75 years. Yet doctors are not learning this information in medical school. The solution to that problem is simple. Healthcare reform activists must demand change from the Liaison Committee on Medical Education and from state legislatures. The LCME can take away the accreditation from any U.S. medical school that fails to provide proper training in nutrition. State legislatures can require continuing education in nutrition for doctors who want to renew their licenses.